Hi everyone! 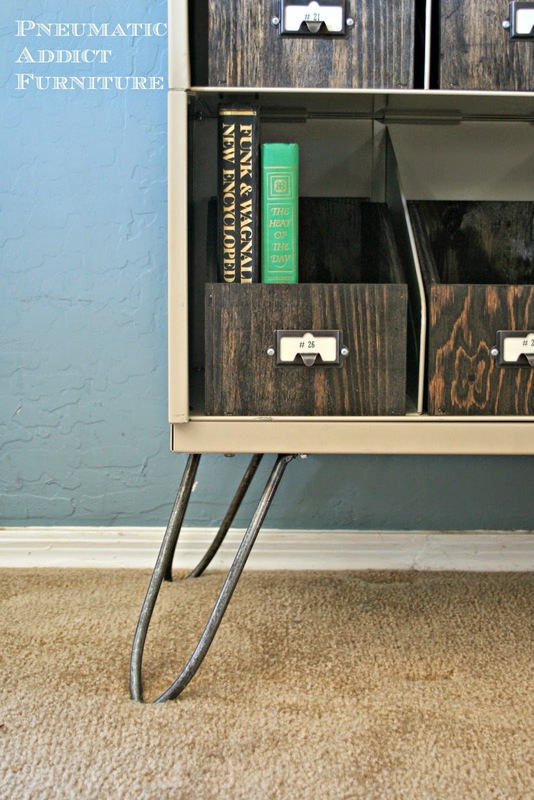 I shared my Mid-Century Industrial Storage makeover with you last week and promised a hairpin leg tutorial. Did you know hairpin legs are hot right now? I know, my husband was shocked as well. He doesn't quite understand the huge Mid-Century craze that is going around right now. 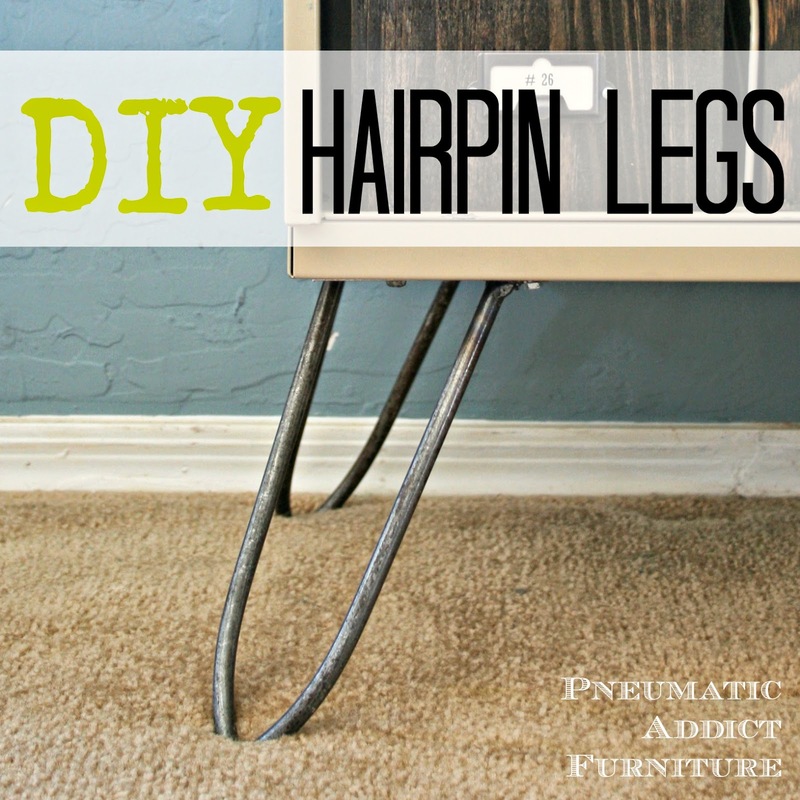 I love hairpin legs because of the vintage/industrial look the give something. You guys, you have to try making these! Don't be scared because they are metal! They were really so easy to make, and cost a fraction of buying them pre-made. Probably the hardest part of making your own hairpin legs is uniformity. What is going to help with that is using a pipe bender. This is mine, we bought from Harbor Freight years ago. If you use a coupon, it shouldn't cost more than $80. You can make your money back in the first set of legs you fabricate. And think of the other cool projects you could create! Don't have a Harbor Freight close by? 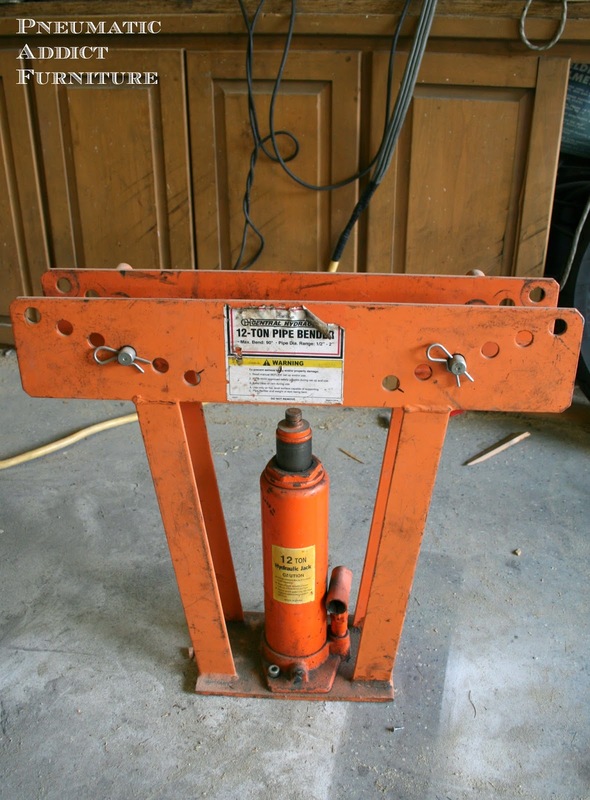 Here is a link where you can buy an almost identical bender online: BENDER 12 TON PIPE BENDER . 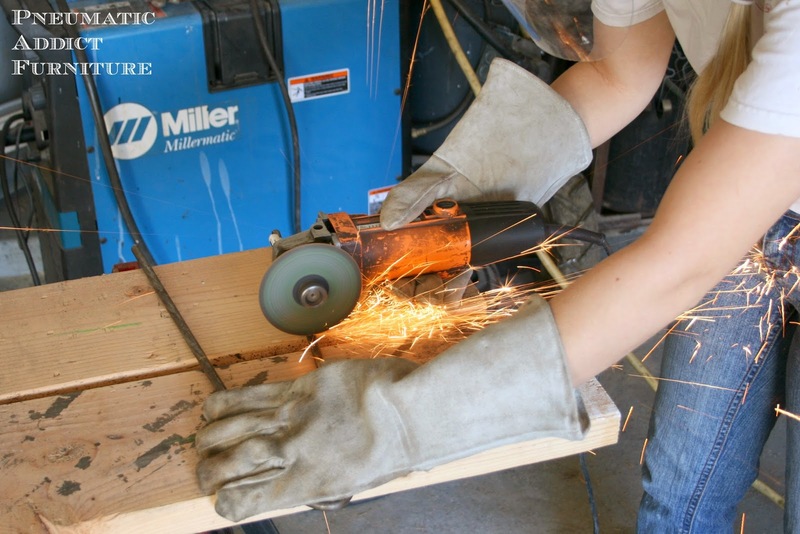 -Angle Grinder with cut off wheel and grinding disc. The bender comes with a variety of sized dies to use. 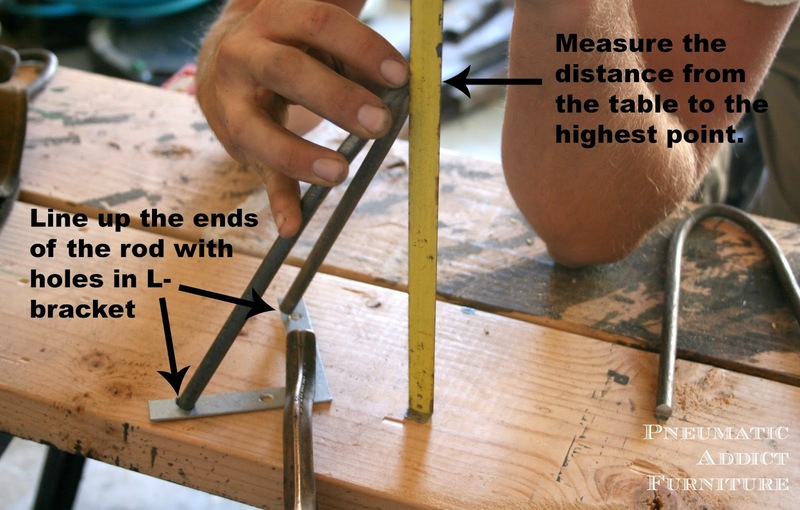 I was using 3/8" steel rod, but unfortunately my smallest die was 1/2". I used it anyways and it worked just fine. 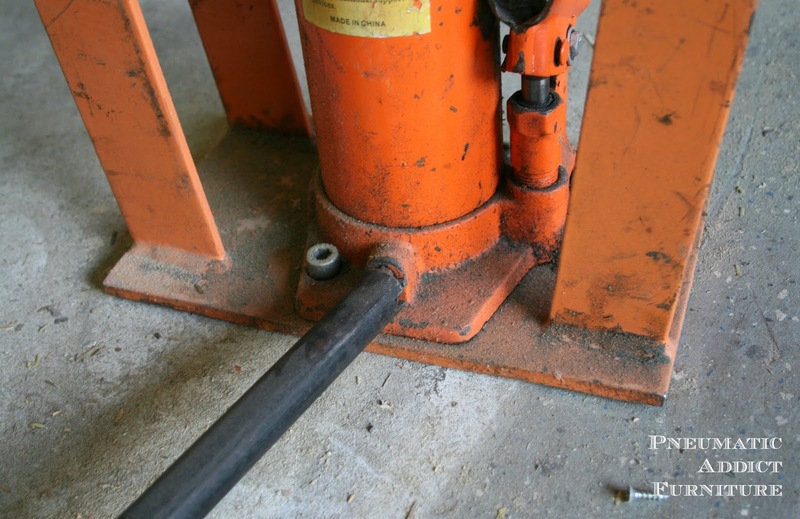 Once you have the bender set up, the first step is to line up your steel rod. Make sure to not only center the die on the rod, but make sure the rod is square in the die. Then, pump the bender up as far as it will go. On this type of bender it will likely be only slightly tighter than 90 degrees. To remove the rod, twist the pressure release valve. The jack should drop and you can pull out your bent rod. 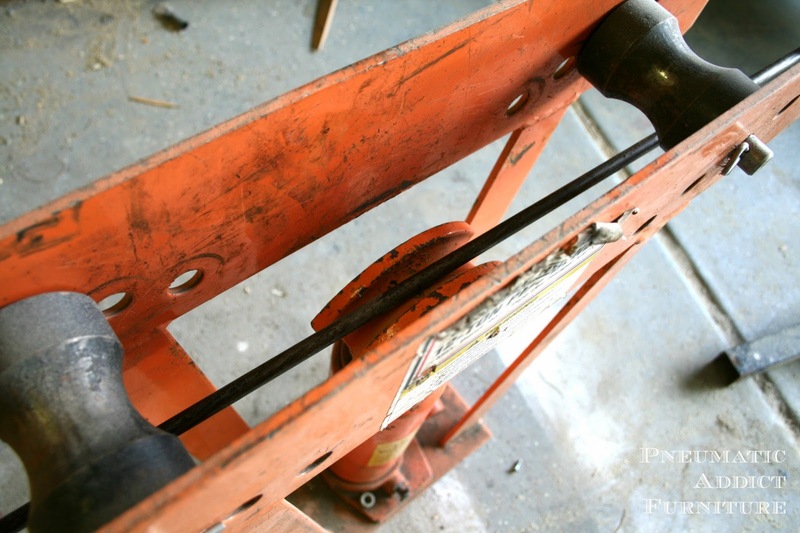 To keep the rod from twisting, I discovered it nestled in the relief cut in the concrete floor of my garage. At that point, I just had to step on the bottom leg, and pull down, bending the rod as far as I could. This is what I ended up with. Not bad! I have seen rounded hairpin legs like this before, but I like the look of a sharper angle, so off to the bench vise we went. 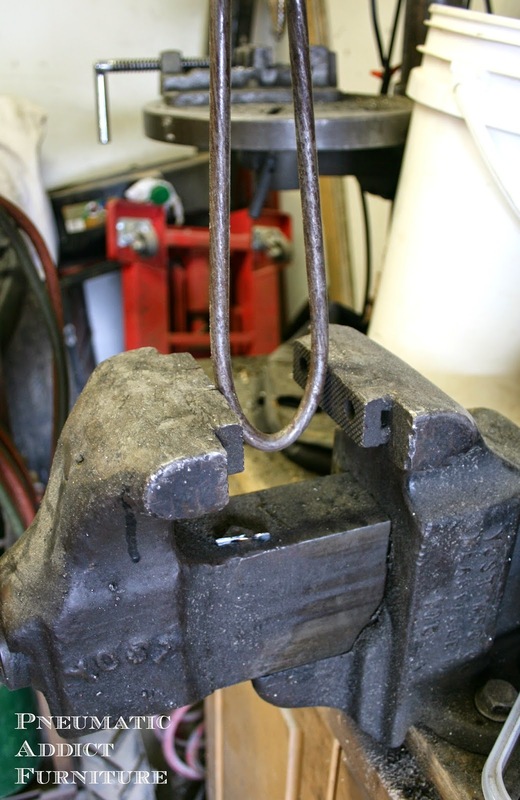 A bench vise is an extremely useful tool! 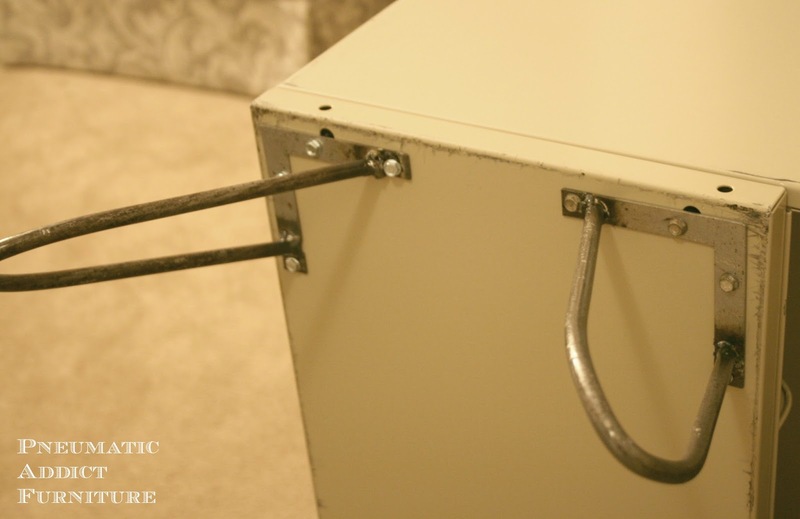 I've used it to hold bolts that I need to cut off, like on my Don Draper Desk, and it is absolutely essential to create Custom Casters. After tightening the angel in the bench vise, this is what my rod looked like. Much better. Next, I need to cut my rod down to length. I measured 8" down from the center of the arch, and marked both legs horizontally. Then, using an angle grinder and a cut off wheel, I chopped off the excess. 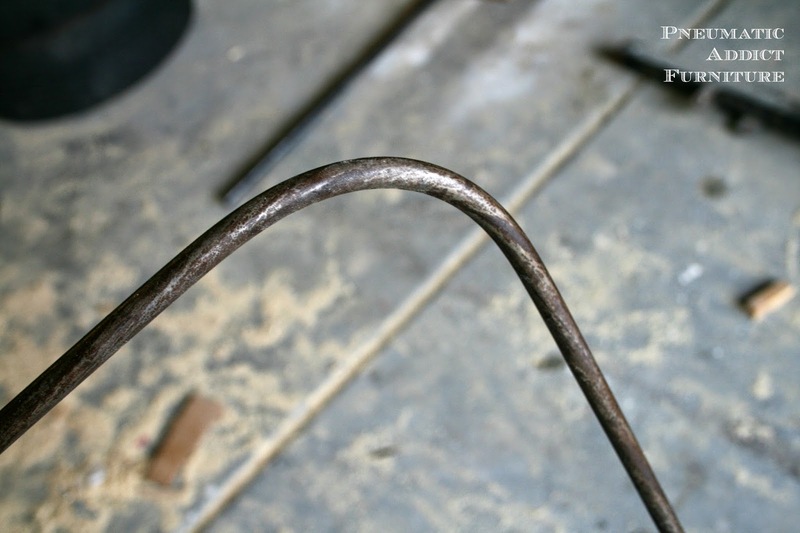 Don't worry about cutting the ends at an angle, you can adjust that when welding. For this next step, you need an extra set of hair arms. I lined the ends of the rod with 2 pre-drilled holes in the corner brace. 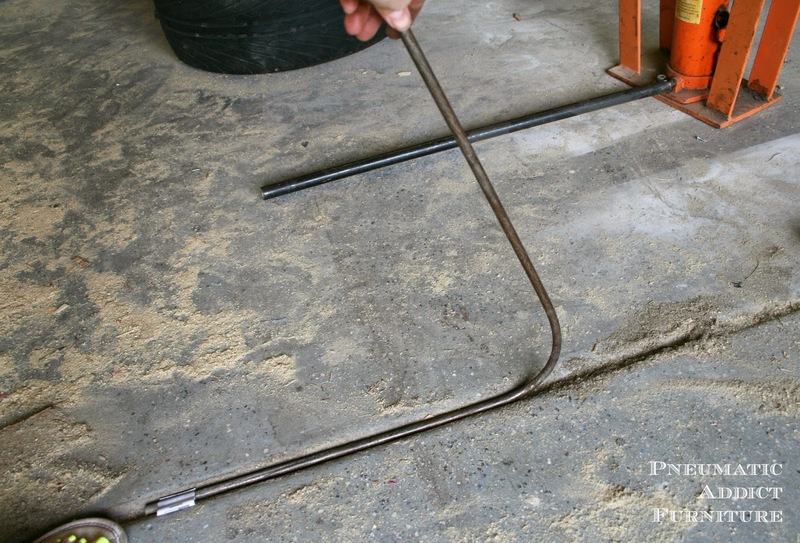 Not necessary, but it made it easier to line both ends up perfectly and it made it possible to weld the rod on the backside as well, creating a stronger attachment. To find the angle I wanted the legs to sit, I simply held up a tape measure, and measured the distance from the table to the top of the arch. This way, for the other 3 legs, I only had to line up the rod ends in the same holes, and adjust the arch till it was at the same height. At this point, both my hairy-armed helper and myself put of a pair of welding gloves and a hood. 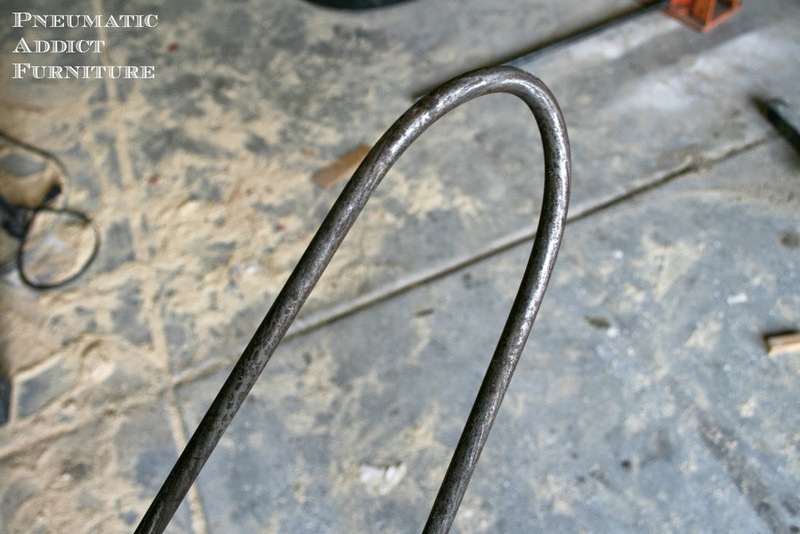 He held the arch in place while I welded the ends of the rod to the corner brace. To make sure these legs were super strong, I flipped the corner braces over, and welded through the hole. In order to get a nice, flat mounting surface, I ground down the welds on the backside. We have a bench grinder we picked up on craigslist for $20, but an angle grinder with a grinding disc would work just fine. After that, I drilled an additional hole on either end of the corner bracket. The last step is to mount your legs to the underside of whatever furniture item you want. 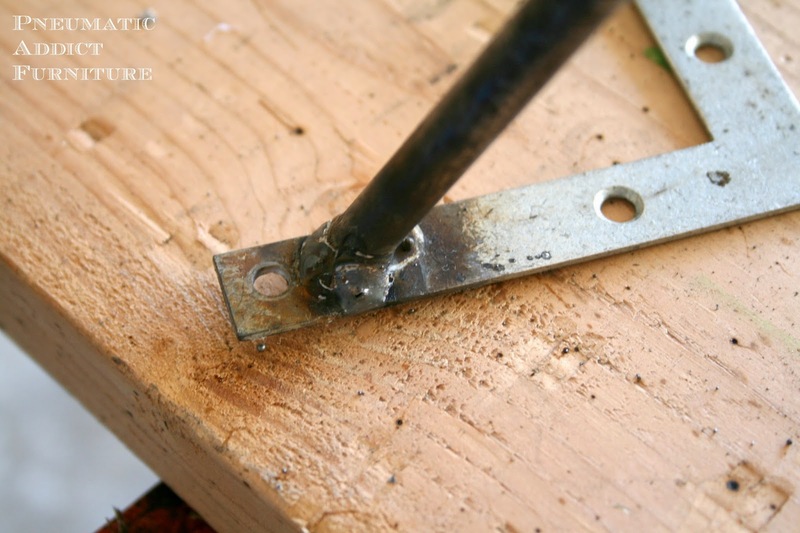 For metal, you would want to either use self taping, sheet metal screws, or drill a hole and use nuts and bolts. 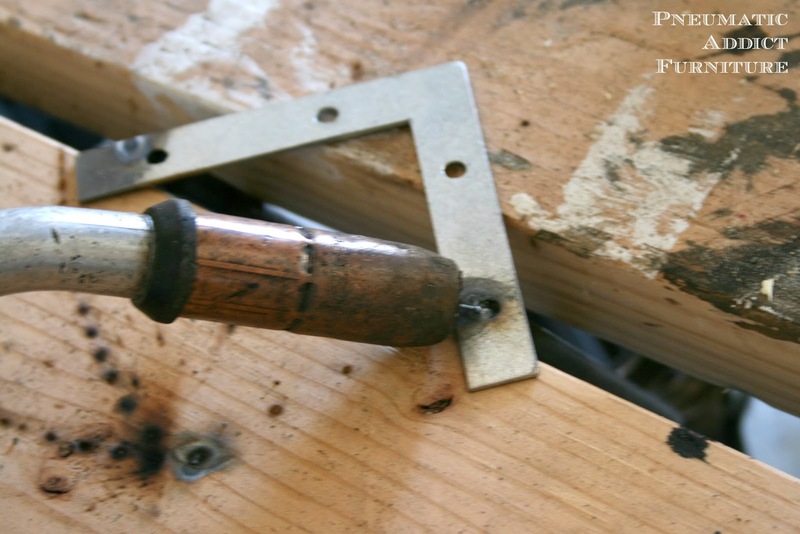 For wood, you can just use some heavy duty wood screws. Here's the final look! 3/8" Steel rod was perfect for 8" legs on this Industrial Shelf, but if you want to create longer legs, or hold up something really heavy, I would recommend 1/2" rod. Are you ready to make a set of hairpin legs?! C'mon! I know it involves using some tools you may have never tried, but I promise, its not too hard to learn, and you'll feel super cool! You.are.amazing. In a hundred years, maybe I will be as cool as you, maybe! I love them! Seriously Elisha, you are one of the coolest girls e.v.e.r. - you can do it all. Those hairpins look awesome. 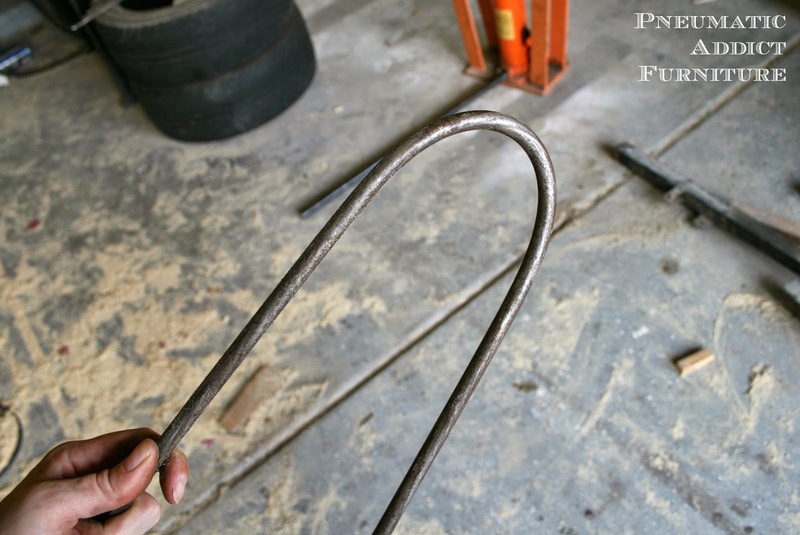 Oh my goodness, the beau and I have been brainstorming ways to make our own hairpin legs for over a month now... and you've taken ALL the guess work out of it! Kind of sad I didn't see your post sooner since we JUST took our bi-annual trip to Harbor Freight this past weekend. Ahh, well it's on the list for next time!! nice DIY, and great work. but please, in the future, make sure you tuck your hair into the back of your shirt. 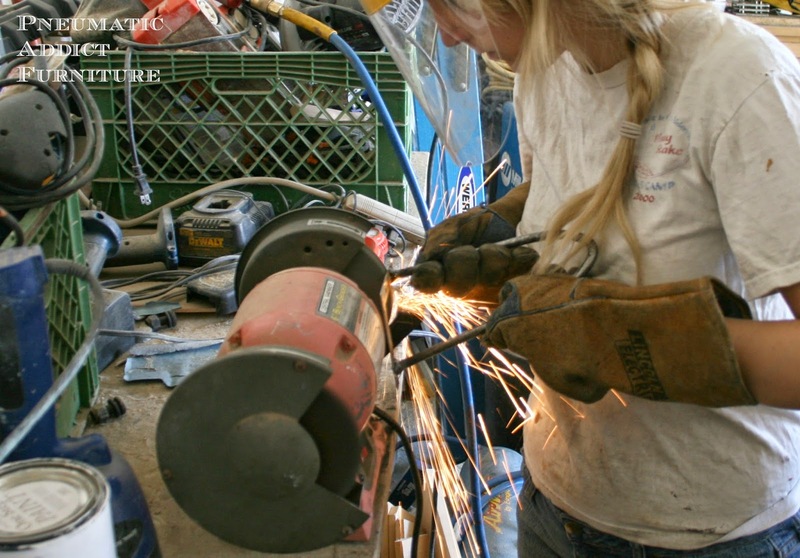 the pigtails are a start, but if one gets caught in that bench grinder, you're gonna be scalped, if you're lucky. You got your hot-rolled (HR) and cold-rolled (CR) steel reversed. 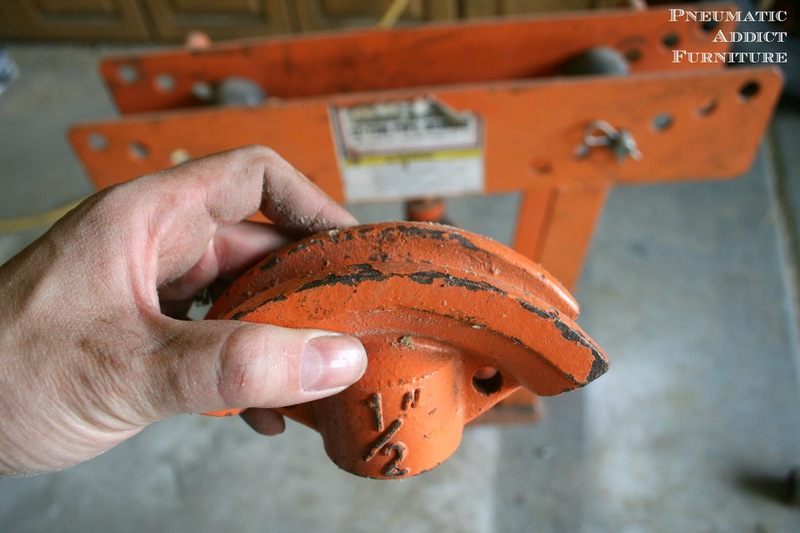 HR is much softer than CR steel though at the diameter you're working with it probably doesn't make a difference. CR is going to be shiny and grey and HR is going to be black and have a dull finish. Oh my god. You are awesome. 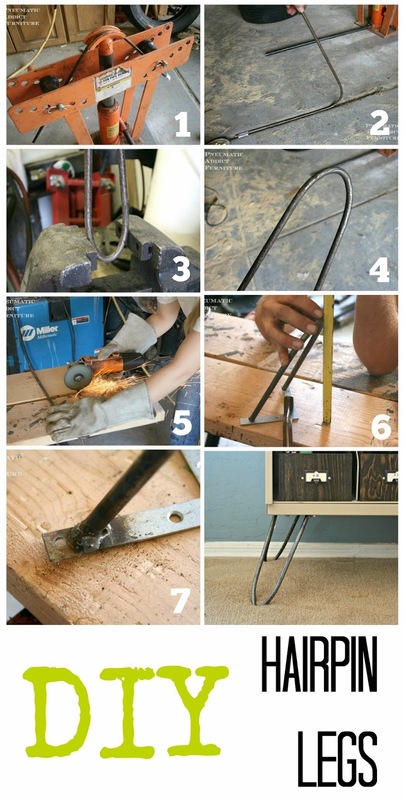 The way you used all the tools to make this amazing hair pin legs is mind blowing. Salute to you. I am also crazy about metal table legs. I would have definitely tried this out but I already got it from http://www.complement-ltd.co.uk/product-category/table-legs/ . But surely I will suggest it to other people around me & try it in future for my own house. Thanks for the amazing post.